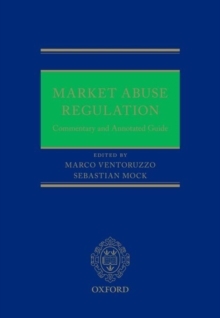 This book analyses the European market abuse regime contained in the Market Abuse Regulation (MAR) and related directives and regulations. Written by leading scholars in the field of capital market law from a number of European jurisdictions, the book is divided into two main parts. The first consists of chapters considering relevant issues by topic; whilst the second provides the first article-by-article commentary on the Regulation, with a detailed and technical analysis of its terms. In the first part guidance is arranged by topic and includes aspects not directly addressed by MAR such as enforcement, and the impact of USsecurities regulation. As well as considering the sources of market abuse regulation in general, this first part also examines its theoretical and economic framework in order to provide better understanding of the Regulation itself.